The new film from writer-director Martin McDonagh, Three Billboards Outside Ebbing, Missouri, covers similar thematic ground to his first two feature films, In Bruges and Seven Psychopaths. A horrific crime leads to a spiral of pain, anger, revenge, and violence that seems to beget only more pain, anger, revenge, and violence. But unlike the stylized gangster-world setting of McDonagh's earlier flicks, Three Billboards sets its action in an outwardly unassuming American small town. The victim was Mildred's teenage daughter, Angela. It was an ugly, horrific crime that leaves a gaping hole in Mildred. The Chief Willoughby who is being called out is a thoughtful good ol' boy, played with ease by Woody Harrelson. Chief Willoughby is sympathetic to Mildred and the rawness of her feelings, but he simply doesn't have any promising leads. He's also somewhat distracted by the fact that he is dying of terminal cancer. The whole town knows of Willoughby's predicament, and certain folks try to drop hints that Mildred should back off. But Mildred is not the kind of woman to back off. Sam Rockwell plays Dixon, one of the officers under Chief Willoughby, who doesn't take kindly to Mildred's stubbornness and whose temperament is that of an under-educated bully. Known for beating information out of witnesses, Dixon puts the pressure on Mildred by physically threatening the young man who runs the billboard company (Get Out‘s Caleb Landry Jones) and arresting her friend (Amanda Warren) on B.S. drug charges. Things do not get friendlier from there. McDormand and Harrelson play off of each other well, spinning new variations on the kind of roles they've settled into in recent years. McDormand's character is hard-edged and intelligent, with no one left to answer to except herself. Harrelson's Willoughby, meanwhile, is like the sweetheart version of his True Detective character, Marty Hart: a hyper-competent investigator turned world-weary peace-keeper. When these two go head-to-head, they are equally matched combatants: respectful, even caring, but unwilling to budge an inch. Their scenes together are outstanding, and if the Academy can stomach the violence and murky morality that writer-director McDonagh serves up in the film's latter half, one can easily see these two getting Oscar nominations for their work here. Sam Rockwell, too, is particularly striking as Dixon. At first, it seems like a one-note villain role, but McDonagh pulls back the layers on almost all of his characters as the film unspools, locating their core of humanity for the audience, even if the other characters never get a chance to see it. This approach to character ironically reminded me of Paul Haggis's Best Picture-winning Crash, which also attempted to show the "good" in "bad people" and the "bad" in "good people." I was reminded, however, only because Three Billboards communicates this same idea 1000 times more effectively than a mediocre film like Crash could. There are no easy answers or straightforward motivations here. Even as McDonagh drops in new puzzle pieces to illuminate the world of his characters, or sets them on new trajectories toward inevitable tragedy, Three Billboards is never rote or predictable. 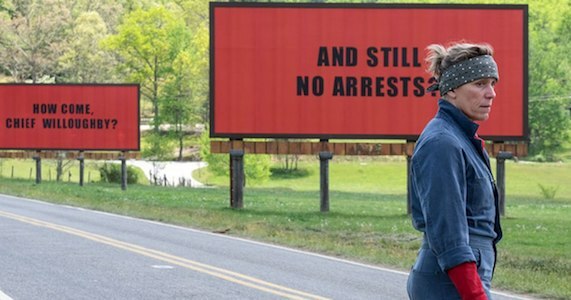 The intelligence of the writing and the strength of the performances -- by a cast that also features Abbie Cornish, John Hawkes, Peter Dinklage, and Manchester by the Sea‘s Lucas Hedges -- make Three Billboards the kind of film that invites, and no doubt will reward, multiple re-watches in the future. Order "Three Billboards Outside Ebbing, Missouri" now!